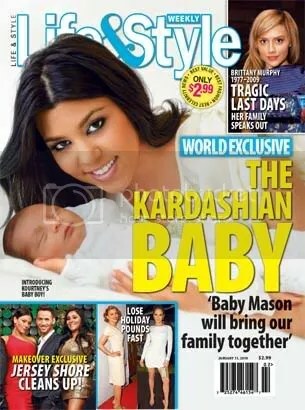 Kourtney Kardashian and boyfriend Scott Disick feature on the cover of the current issue of Life and Style magazine and introduce their gorgeous 2-week-old baby boy Mason Dash. Kourtney: It feels amazing. It’s just so indescribable. You don’t get how good being a parent feels until it happens to you. Scott: My first time holding him was definitely special. But holding him the second time was even more special, and the third time was even more special than that. I fall so much more in love with this kid every day. I can’t imagine how much more in love with him I’m going to be by the time he’s 5 or 10 or 20! K: It was surprisingly easy and just an incredible experience. I always thought your first is supposed to be really hard, but it was easy. I have an amazing doctor. He actually delivered me! The room environment was just so relaxing, and everyone I wanted to be there was there —Scott, my mom, Kim and Khloe. No one under 18 is allowed in, so my little sisters Kendall and Kylie couldn’t come in. Actually, you’re only allowed to have two people in the room because of the swine flu — so we snuck Kim and Khloe in! K: We’re on Mason’s schedule, waking up every couple of hours to breastfeed. But it’s fun to get up and see him. I miss him by the time I see him again. K: Right now I’m obsessed with Mason and want to give him all my time. But being with him has definitely made me think about having another one! Kim and I are 18 months apart. Growing up, we did everything together. It would be nice for Mason to have a little brother or sister that many months apart too. K: The first time I started looking at baby names, Mason was the only one I liked. “It was the only one that stuck with me. Right before he was born, I told my aunt we were thinking about going with that for a name. She told me that Mason means the same thing in English that Kardashian means in Armenian — stone worker. Another aunt told me my great uncle used to use the name Mason when he made dinner reservations, because Kardashian was too long. When I heard that, I thought, Oh my god, it’s meant to be. Dash is not for my clothing store, as some people have suggested online. That would be stupid. Dash is short for Kardashian, and it was my father’s nickname. K: We call him Mase and Baby Mason. And then all of the cutesy names: Gorgeous, Precious, Munchkin, Angel. This entry was posted in Baby Photos, Cover Stars, Dad and Baby Photos, Interviews, Introducing, Magazine Shoots, Mum and Baby Photos, News. Bookmark the permalink.